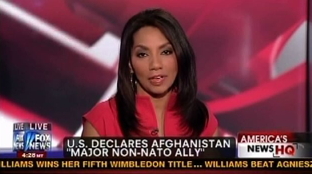 Religious discrimination at Fox News exposed! But there’s a catch. But there’s a catch, and it involves the story of someone who is not a writer for Ellen Brodsky’s smear site and does not hate Catholics. This person is a respected community leader, educated at the New York Theological Seminary, who served as Executive Adjunct to Suzan Johnson-Cook, president of the prestigious Hampton University Minister’s Conference. 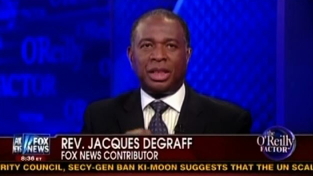 A prominent liberal activist, he was New York President of Rev Al Sharpton’s National Action Network. He was recently honored by the Consulate General of Israel with the Martin Luther King Award for ‘spreading compassion and uniting communities of all backgrounds’. A most distinguished curriculum vitae for this man, a minister at New Canaan Baptist Church in Harlem. Then are we to conclude that Miss Prissy knows about Rev de Graff and is simply lying? Again? But unlike Fox (and Johnny's man crush, Bill O'Reilly) I am perfectly willing to stand corrected. Of course Miss Prissy might have forgotten that appearance. It was some time ago...yesterday! Needless to say, neither has Priscilla corrected her lie of omission about Harris Faulkner, who is only the most prominent, and most watched, black straight news anchor on US cable news. But remember, Priscilla is ‘willing to stand corrected’. See the pattern? Falsify facts, get caught doing so. Wait two weeks, repeat, and get caught again. When you do the same thing over and over expecting something different, but keep getting the same result...what do they call that again?